Packers pay more than $75 million in CAB grid premiums each year. Are you getting your share? The 13th annual Feeding Quality Forum in Sioux City, Iowa, offered new insight on a variety of topics, from a detailed market outlook to consumer perceptions of the beef industry. Feedyard managers also shared their ideas on employee management. Producing quality beef and feed sample testing were also discussed. To hear from the speakers and read news coverage and click the button below. 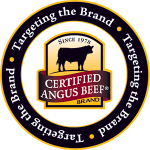 Leverage the brand to help market registered Angus bulls that meet our EPD requirements and get rewarded for using the logo.